Dogs head design featuring a `head out car window` look complete with blowing tongue, etc in red candy colouring to match her bike. Murals on top and rear of the customers dogs also. 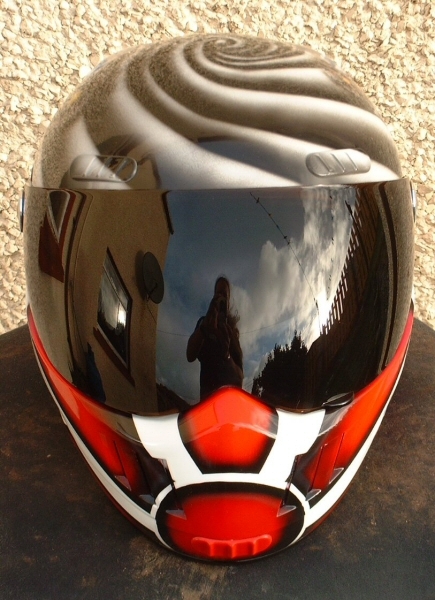 QUite a fun helmet. 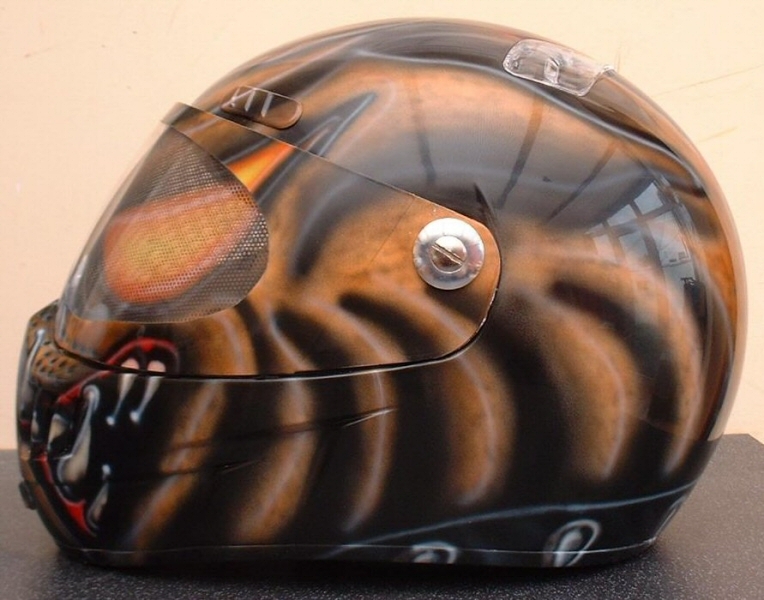 Hockey helmet done in purple and pink siberian tiger theme to match outfit and team colours. Lots of detail work and layered fur, etc. Tiger logo and nickname to rear. Intricate indian head dress childs helmet featuring lots and lots of detail work and different elements as you can see. Layered feather effect and sequence headband, etc. Something very different. 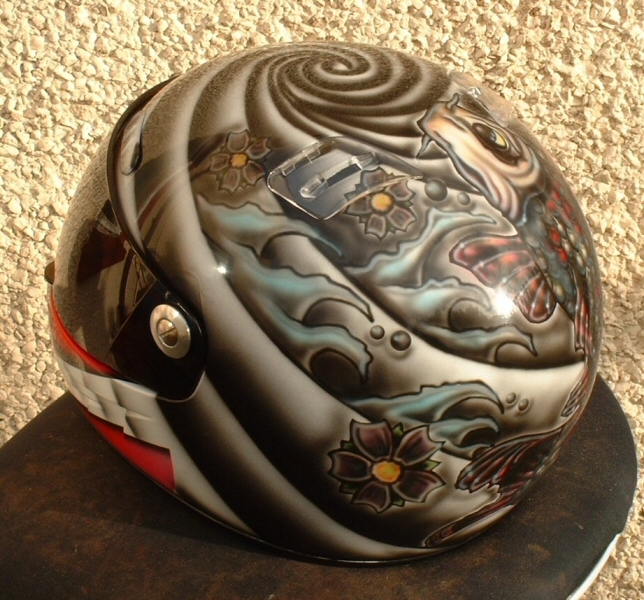 Alice in wonderland themed helmet in slightly different layout and content to previous one to keep it unique. Highly detailed artwork throughout and use of candies, etc. 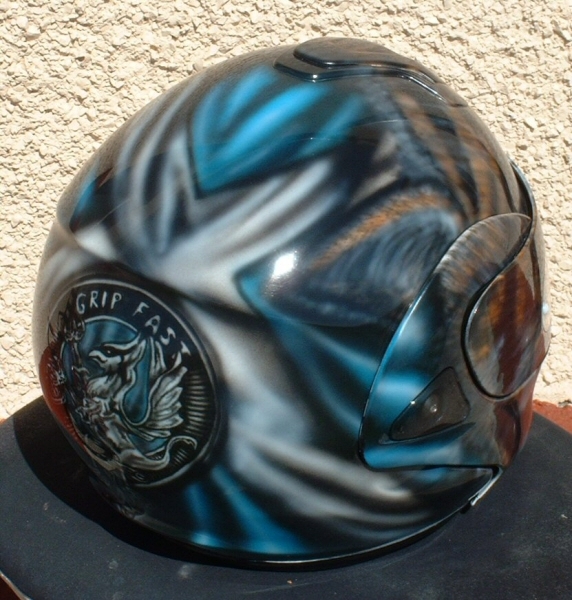 Really nice helmet this one. 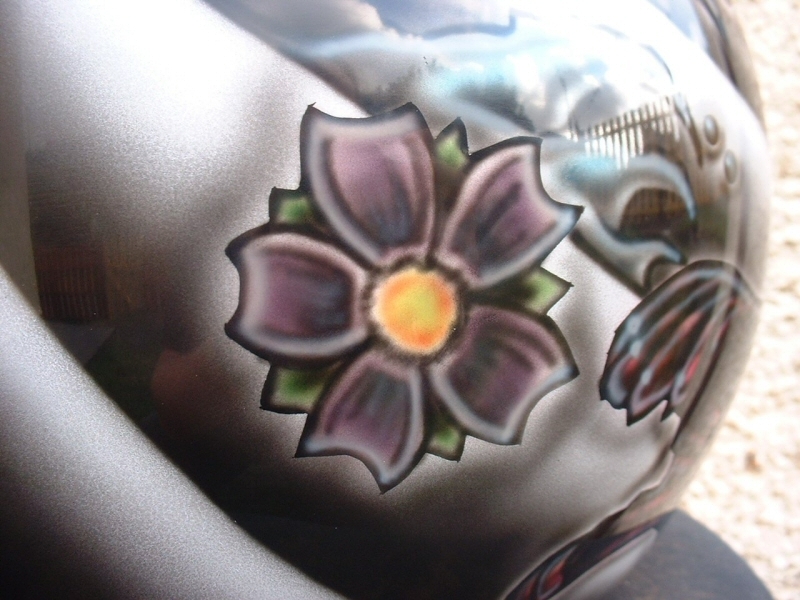 Alice in wonderland themed helmet done to match the owners bike I also painted in similar theme (see bikes section). Highly detailed artwork throughout and use of candies, etc. 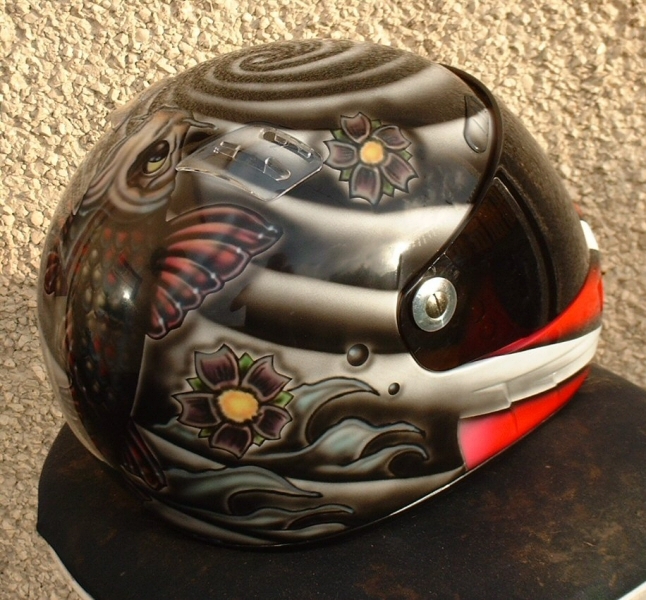 Really nice helmet this one. 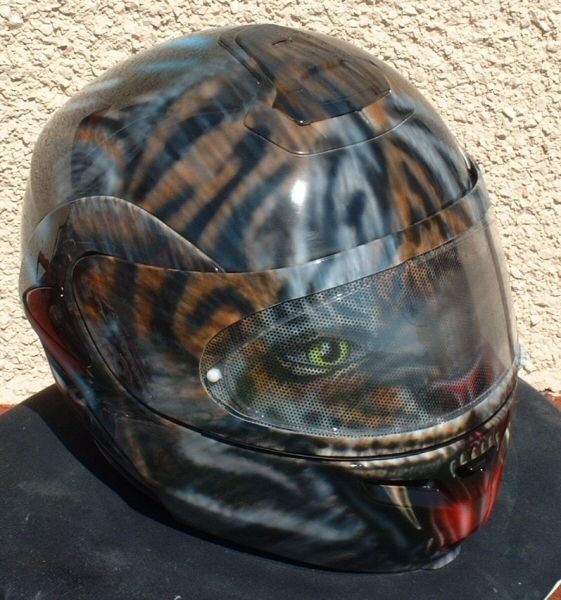 Siberian tigers head helmet done on a very spherical BMW flip front helmet. Detailed mouth area with 3D teeth effect. 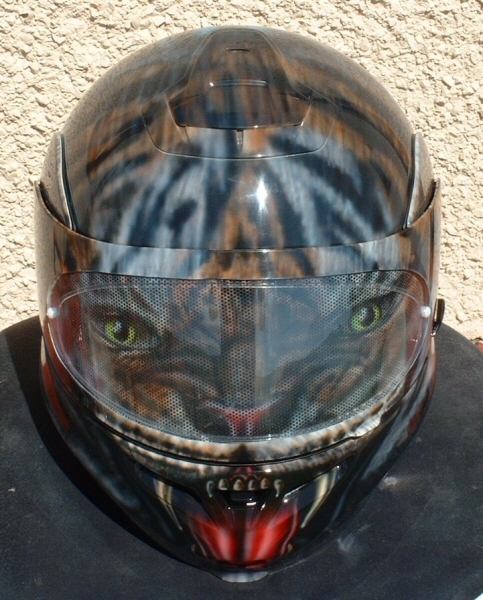 Colour fade fur effect accross rest of helmet. 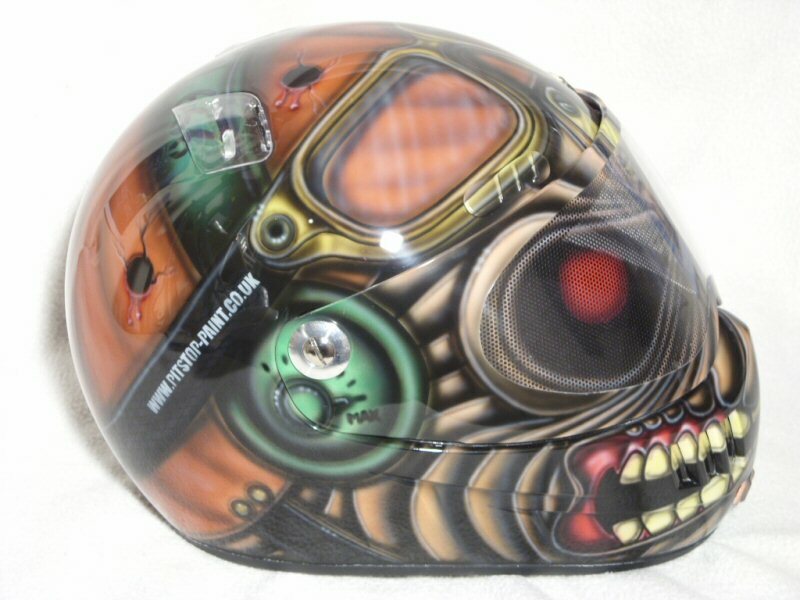 Visually striking helmet. 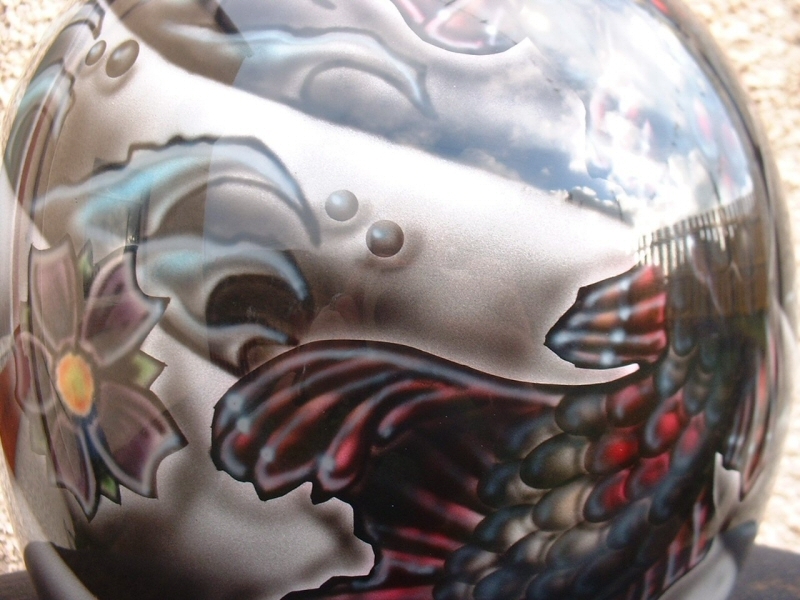 Sharks head design done on a flip front helmet. Features lots of nice detailing such as water droplets and remora fish to rear, etc, etc. 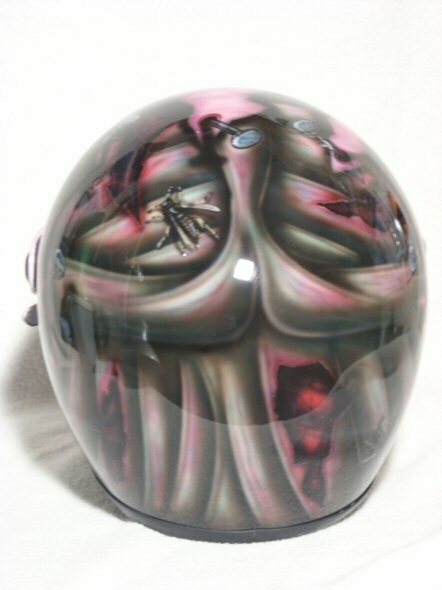 Visually striking helmet. 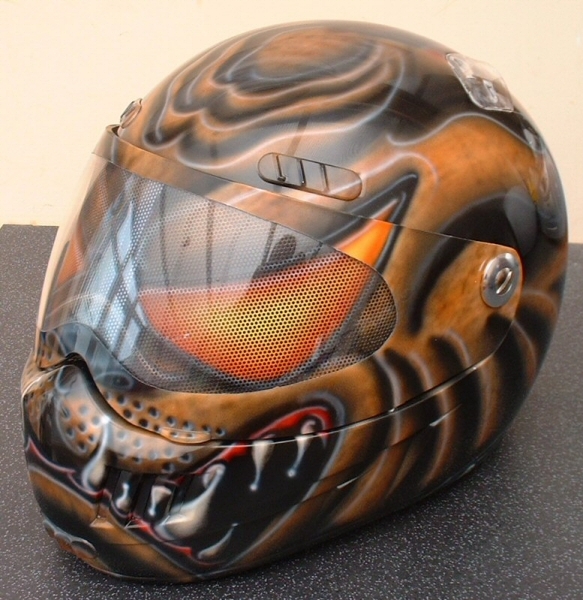 Anti fox hunting themed helmet featuring a mural to the rear to match the owners tattoo. Rest of helmet done as a fox's head with multi layered fur effects in candies, etc. Design created from scratch by myself to customers outline ideas. Full metal jacket style army helmet with camoflage and bullet detailing, etc. Badger face to front. Something very unique and eyecatching. Design made up by myself for a tattooists birthday incorporating one of his first tattoo designs (bulldog) and the names of his freinds that contributed to the surprise present on the dogtags. True fire, skulls and metalflake union jack in background. 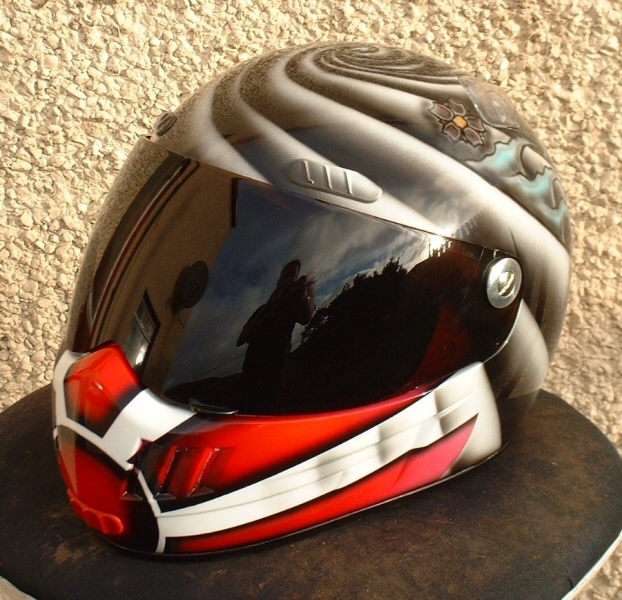 Very smart small detail helmet. Design created from scratch by myself to customers outline ideas. Gaunt face to front with worn/smashed brass goggles, etc. Worn union jack bandana with knot to rear. 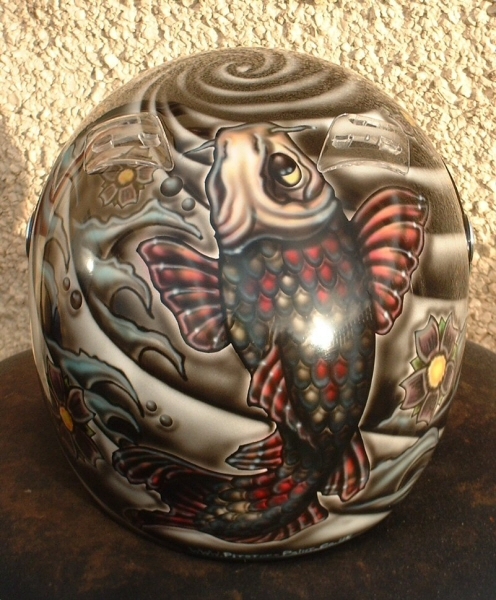 Tattoo style Koi design to rear featuring lots of small detail throughout. 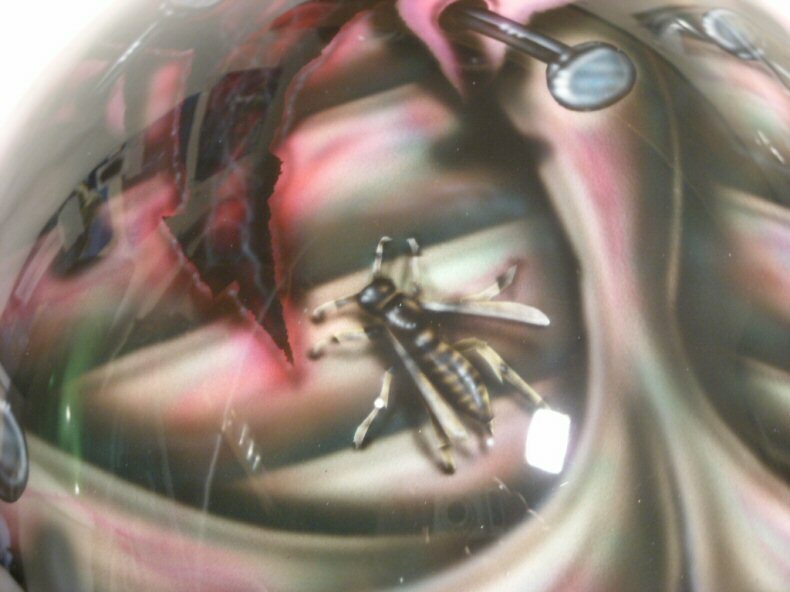 Hockey helmet done in baboon theme with club crest to rear. Design done to match customers request incorporating happy windswept monkey face to front with hair strand detailing, etc. Factory logo and bikes logo to rear. 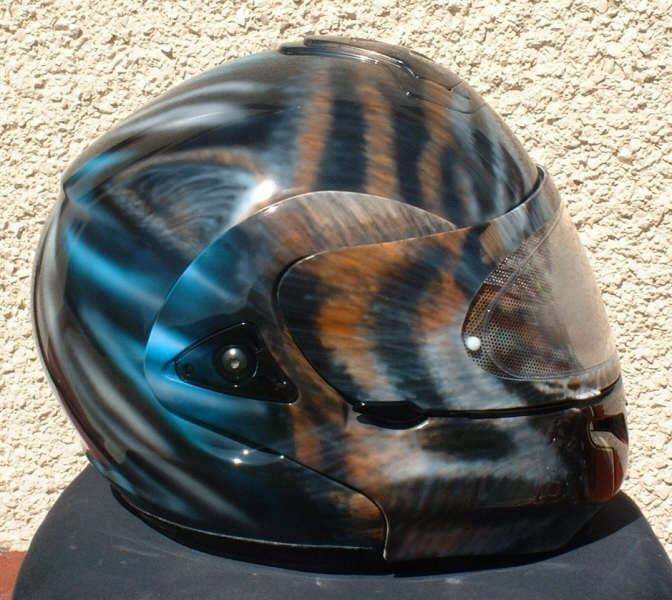 Was done especially for BMW entry into Cannonball bike race 2010 aboard a S1000RR. Koi design in japanese tattoo / watercolour style based on drawings supplied by owner. Featuring waves, water droplets and water lilies. Lots of fine detail! 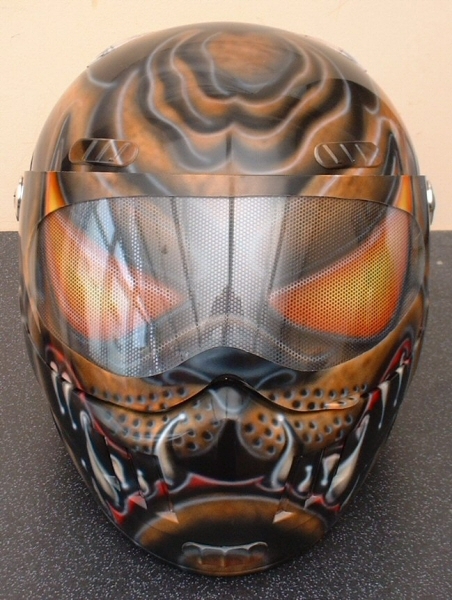 Flip-Front helmet painted with tigers face, fading into Scotland flag to rear with clan crest in centre. Multi-layered fur effect for great visual impact. 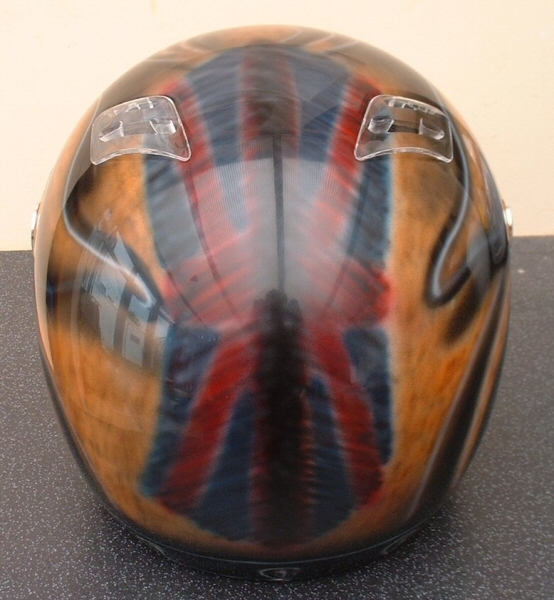 Mean bulldog design with Union Jack mohican detail to rear. Looks great when worn!